A card game about Japanese geisha by Seiji Kanai. 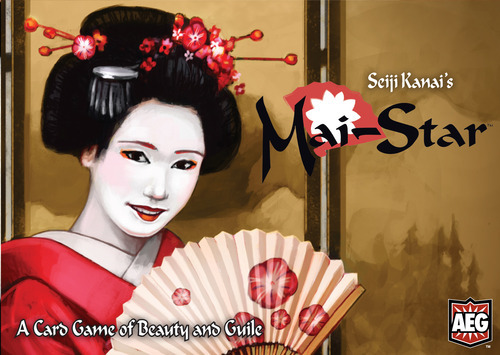 Players take the roles of various geisha, and compete with the other players to win the legendary title of "Mai-Star". Use the characters surrounding you to increase your popularity, and earn money by attracting guests, the more demanding the better. Focusing only on increasing your popularity won't earn you any money, yet failing to spread your name won't make the rich or helpful guests come your way. It's a matter of deciding which characters (cards) will help you increase your popularity and which character cards you want to attract as guests. Once a player runs out of cards, the round is over, and all cards remaining in your hand become minus points, thus depleting your hand of cards quickly is important. Only the one who has attracted the richest guests (earned the most money) after three festival nights (rounds) will be the one who deserves to carry the title of "Mai-Star". This game's setting is same as Master Merchant. 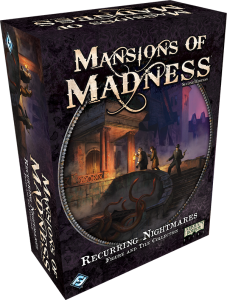 The first of the two Figure and Tile Collections, Recurring Nightmares, includes all eight investigator figures, eighteen plastic monster miniatures, and fifteen double-sided map tiles from the Mansions of Madness First Edition core game. Take on the role “Ashcan” Pete, the drifter, and make use of his loyal hound dog, Duke, or assume the attributes of Harvey Walters, the brilliant professor. With Recurring Nightmares in your collection, you may also encounter a host of long-forgotten monsters, such as the fearsome Chthonian or the unpredictable Maniac. When you include the First Edition core set or Recurring Nightmares pieces in your game, you will also gain access to a brand new scenario. Tasked with solving the mystery of missing bodies from Hangman’s Hill Cemetery, you and your fellow investigators will need to explore the misty and sinister graveyard. You may find the corpses you seek, dead as they ever were, or perhaps some sinister reanimation of their bodies will find you first. 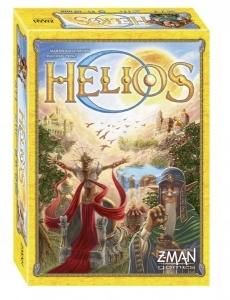 In Helios, players are high priests in a distant world of the sun god AHAU, and the power of the sun drives everything in the game as players try to build temples, expand cities, and make their civilization flourish. Development can succeed, though, only if you've secured a supply of the limited raw materials available, and the more that you've built of your temple, the more expensive the remaining parts will be. Glass manastones are the game's currency, and with them you can acquire people, increase the number of points you'll score, and more. At long last, the circus is coming to Carcassonne. The ringmaster has organized a night full of stunning acrobatic routines that will leave you speechless, while the most talented artists show their latest tricks. Followers can now be trained to perform human pyramids, and a circus tent will attract the people of Carcassonne, while the ringmaster keeps things organized and visitors calm and quiet. 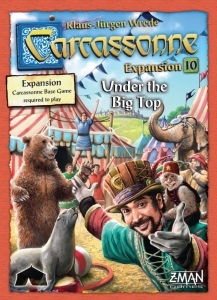 Carcassonne: Under the Big Top is the tenth large expansion for Carcassonne and the first large expansion released exclusively for the second edition of Carcassonne. Part of the Carcassonne series.